Are bananas something you can share with your dog or should you keep them to yourself? This article will give you a detailed answer. Bananas are one of the most popular fruits for us humans. We use them in cereal, smoothies or as a snack, as they’re real energy-boosters. No wonder you want to share some with your dog! But, the question is – is it safe? Dogs love to eat, that’s a fact! However, many dogs are not very picky and they may eat pretty much anything they can come across. Unfortunately, it can result in eating something they shouldn’t and that’s bad for them. 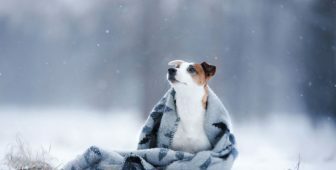 Therefore, it’s your responsibility as a dog owner to know what’s safe for your dog to eat and what should be kept far away from your best friend. As always, we’re here to help you. Can I Give My Dog Bananas? The short answer to this question is – yes, dogs can eat bananas! They’re not toxic to dogs in any way. Not only are they safe for dogs to eat, but they’re also healthy as well. However, it’s important to feed bananas in moderation. Also, remember that every dog is different, so even though bananas are safe, it doesn’t mean your dog will like or enjoy them. Therefore, introduce bananas slowly to your dog’s diet – like any other new food for that matter – and wait and see what the reaction will be. Before we continue, check out the video below. Now, let’s discover what makes bananas healthy! Why Are Bananas Healthy For Your Dog? Bananas are very healthy for us to eat, nothing new there! But did you know that they’re actually beneficial for dogs as well? They’re a great source of vitamins B and C, and the minerals magnesium and potassium – all of which are desirable for both dogs and people. Potassium –is very beneficial for the balance of fluid and electrolytes in your dog’s body. It also has an important role to play in the function of the nervous system. Vitamin B6 (Pyridoxine) – is important in the production and function of haemoglobin, which transports oxygen around the body to the vital organs. Vitamin C – is an antioxidant, which helps to preserve and repair cells in the body. It is also important for good immune system function. Biotin – is an important type of vitamin B that helps maintain healthy skin, fur and nails. It also promotes healthy blood sugar levels. Bananas are great for improving your dog’s bowel movement and protecting its stomach from ulcers, acid secretion and gastritis. On top of all that, bananas are low in sodium and fat, while being high in antioxidants, vitamins and minerals. This combination helps to contribute to a better working immune system and gives a boost to your dog’s energy levels too. Its also great news for your dog’s skin and coat, which will also benefit from bananas too! Finally, have you ever heard of the BRAT diet? If not, this diet stands for Bananas, Rice, Applesauce and Toast – recommended for a couple of days in the case a dog has diarrhea. Another great benefit that can come from some banana slices! How Many Bananas Should Dogs Eat? Bananas are high in sugar, therefore you should be careful with the amount of banana you give to your dog. Your dog will be able to enjoy the benefits when given small amounts, as giving your dog a large amount of banana daily may cause your dog harm! Why? This is why you should only feed bananas occasionally, in small amounts. The amount will depend on your dog’s size, but in general a banana per week is enough – divided into slices throughout the week. Start off slowly and see how your dog will react. How Do I Serve Bananas To My Dog? Bananas can be served in many different ways, which allows you to be creative if you want to. However, there are a couple of guidelines you should follow when giving this fruit to your dog. The best way of serving bananas to your dog is by removing the peel and cutting the fruit into bite-sized chunks. You can also mash them together with some other food. It is best not to give the whole banana to your dog, due to it’s high sugar and potassium levels. Also, the bigger the piece is, the harder the digestion will be. Another thing – feed your dog ripe banana, not an unripe (green) banana. The health benefits are much better from ripe fruit and your dog will like the taste much more. Can Dogs Eat Banana Peel? Even though banana peels are not toxic to dogs, they contain a very high level of difficult to digest fiber. The banana peel may cause an intestinal blockage if eaten. Try keeping banana peels out of your dog or puppy’s reach. If he eats it, he might vomit a few hours later. Can Dogs Eat Banana Chips? In this case, it is safe to share some banana chips with your dog. They are a good source of fiber, potassium, and vitamins B6 and C. Banana chips make a perfect low-calorie treat that won’t hurt his stomach. However, this is the case with natural, grain-free banana chips. If you share them occasionally with your dog, he will enjoy a light energy boost that can even calm his stomach when upset. Do not feed too many as they are high in sugar and may cause diarrhoea. Can Dogs Eat Banana Bread? Banana bread isn’t something that’s appropriate for dogs, as most banana bread contains ingredients that are very toxic to dogs. Some possible toxic ingredients include chocolate, raisins or xylitol (a sweetener) – all are very dangerous to dogs. But, healthy banana bread recipes that don’t contain sugar or sweeteners might not harm your dog if given in small quantities. You should check the list of ingredients carefully to make sure there are no toxic ingredients hiding in there. You shouldn’t overfeed your dog with too many pieces of banana bread, as it can cause an upset tummy. To sum it up – bananas are perfectly fine for dogs to eat and they’re very healthy as well! They’re rich in potassium, vitamins, and fiber and are especially great for regulating bowel movement. They can be served in many ways, for instance by mashing them up with something else or stuffing a toy with them. The important thing is to feed bananas in moderation, as too much can cause a spike in sugar levels, digestion problems or Hyperkalemia, because of the high potassium level. Finally, avoid all banana products with additives, sweeteners, chocolate or raisins. If you decide to feed your dog with some banana bread, make sure the serving is small. The healthiest and safest way to give your dog banana- is natural, ripe and in small amounts! However, if you wish to make some healthy homemade treats your pup will love, check out the recipes we picked out for you. Here are some great recipes you could try out. This, and similar treats can come in very handy when you want to keep your dog busy. Combine the ingredients in the blender until they have a smooth consistency, spread the mix over the toy and freeze. Simple and fast! Once you peel the banana, place it in a bowl with peanut butter and coconut oil. Then smash it and mix it until it has a good, smooth consistency. If you happen to have some bigger chunks in the mix, just use a fork! Fill a plastic bag with the mixture, cut the corner with scissors and just fill the mold! Put the mold in the freezer, and once you can see that they are easily separable from the silicone, serve a couple of pieces to your dog! Banana chips are so easy to make. All you need to do is to slice a banana about 1/4 inch, sprinkle some lemon juice over and put them in the preheated oven. The trick is to keep your oven at about 250 degrees, and no more, and bake for 3 hours. Flip the banana chips over after one hour and a half. That’s it! You can also stuff your dog’s Kong toy with banana chips and provide him with some tasty amusement. This article has been medically reviewed by Dr Margarita Boyd, BVSc MRCVS. 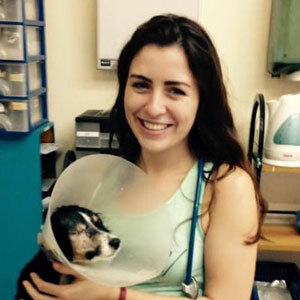 Margarita graduated from the University of Liverpool, earning a Bachelor in Veterinary Science with distinction. She worked in small animal and equine practice for a few years, before choosing to focus solely on companion animals. She has developed a special interest in internal medicine and ophthalmology. Dog’s health and well-being is the top priority for us. Everything you read in this article was reviewed by a medical expert whose name, biography and picture are shown below the article. If you feel that any of our content is inaccurate, out-of-date, or otherwise questionable, please contact us. This article is based on scientific evidence and contains scientific references. The numbers in the parentheses (1, 2, 3) are clickable links to peer-reviewed scientific papers. Our team strive to be objective, unbiased, honest and to present both sides of the argument. Can Dogs Eat Peanuts, Almonds and Pistachios?